You want your baby to get the nutrition they need to grow up strong and healthy. Today most women are breastfeed their babies. Breastfeeding is important and gives your baby just the right amount of protein, carbohydrates, fat, vitamins, and minerals. Breastfeeding provides antibodies and other immune factors.These help protect against infections and disease. Make an appropriate food choices for your baby during the first year of life is very important. More growth occurs during the first year than at any other time in your child’s life. It’s important to feed your baby a variety of healthy foods at the proper time. Starting good eating habits at this early stage will help set healthy eating patterns for life. Breastfeeding is the only food or drink your baby will need for the first 6 months. Babies who are breastfed should get a vitamin D supplement of 10 micrograms (µg) or 400 international units (IU) each day. This will prevent vitamin D deficiency. If your baby is not breastfed, or is only partially breastfed, commercial infant formulas can be used. Non-breastfed infants do not require a vitamin D supplement because the commercial infant formula contains vitamin D.
Don’t give solid foods unless your child’s health care provider advises you to do so. Solid foods should not be started before age 4 months because:Breast milk or formula provides your baby all the nutrients that are needed for growth.Your baby isn’t physically developed enough to eat solid food from a spoon.Feeding your baby solid food too early may lead to overfeeding and being overweight. Resist the temptation or pressure created by advice from people around you. You will receive many well-meaning advices regarding starting dal pani or fruit juices or even water. But, do not give in and do not start solids till baby is close to 6 months and then start solids only with the doctor’s recommendation. If at all you have to start solids before 6 months, ensure that your baby is at least close to 6 months old and start with simple one ingredient food items like rice cereal. Although recommendations are to exclusively feed baby on breast milk or Formula only till the age of 6 months, many families and pediatricians prefer to start babies on some sort of external food sometime between 4 and 6 months, preferably close to 6 month mark. If you decide to start your baby on something other than breast milk or formula between 4-6 months, ensure that it should be very gradual and liquid. You should follow the 3 day rule, i.e. you should introduce only one new food at a time and keep a gap of at least 3-4 days before introducing anything else e.g. if you start your baby on moog dal water, continue giving the same , only about a teaspoon full, for at least 3-4 days. If you see there any allergies/reactions/ rash, discontinue immediately, wait for few more weeks before trying again. According to some studies, proteins are more difficult to digest and hence they should be introduced after 6 months. In that case, you can start baby on rice cereal / fruits / vegetables etc. Any solid food which needs chewing. Cooked and thinly pureed and strained fruits and vegetables etc. Solids at this age are just to introduce baby to something other than breast milk or formula. Take it very, very slow, starting with just a teaspoon of food, gradually increasing it to a tablespoon or so. If your baby does not want to take it, don’t force the issue. There is no need for baby to have solid food at this age. All your baby’s nutrition needs are fulfilled by breast milk or formula, so do not worry, if your baby does not want to take new food. Wait for a few days and then try again. In case you are just starting your baby onto solid foods, you should start you baby on pureed and liquid food. It will be similar to what we discussed in previous section. Dal water, Rice water, Diluted Rice cereal, mashed banana diluted with baby’s milk, cooked and thinly pureed fruits and vegetable. Pass the cooked fruits and vegetables through a strainer, so that there are no lumps. Gradually thicken the purees a bit. Pass the cooked fruits and vegetables through a strainer, so that there are no lumps. You can gradually introduce lumpier, mashed food as well as combination foods. Puree two vegetables or fruits together e.g. Apple and pear– cooked and pureed together, Carrot with potato etc. Dairy – Full fat Curd or Yogurt, cheese. Chunky food – your baby does not have enough teeth, if at all, to chew chunky food and can choke upon them. Low fat curd – You may swear by that slim yogurt, but do not try to share it with your baby. Babies need fat at this age for proper development of brain, so give whole milk yogurt or curd, preferably homemade. P.S. Check with your pediatrician before introducing eggs, fish or meat to your baby’s diet. Whenever you introduce combination foods, ensure that individual items have been safely introduced first. It means that if you want to give carrot and pumpkin soup, both carrot and pumpkin should have been introduced first without any issues. By 8 months, most babies are quite comfortable eating solids and many have sprouted 1 or 2 teeth as well. You can now give variety of cereals, vegetables and fruits to baby. You can also introduce non-vegetarian food now with advice from your baby’s pediatrician. 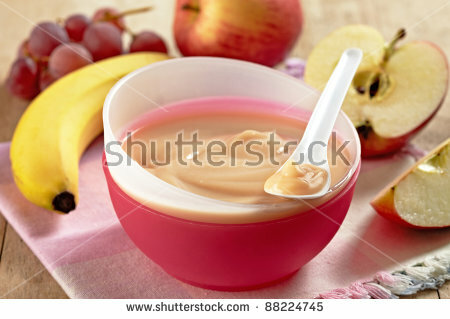 Pureed legumes ,dairy product etc. Different cereals in addition to rice, suji, whole-wheat (atta) , oats etc. You can also give simples soups like tomato soup now. Non-vegetarian proteins like eggs (Check with your doctor before introducing eggs. Egg whites are known to cause allergic reactions in babies, so it is recommended to introduce yolks first and wait to introduce whites after 1 year), fish, chicken. Introduce your baby to lean meat which is healthier. Make sure what fish or meat you introduce is well cooked, deboned and pureed. Follow the rule to introduce very little and only one item at time and wait till at least 3-4 days to screen for allergies etc. Many fishes like swordfish, shark, shellfish etc. are known to be unsafe due to concentrated levels of mercury. You should not introduce these to your baby before one year. Cooked, mashed complex foods- Khichri, vegetable pulao, mixed soups, lentils etc. You can give most of the food you are having, as long as it is not too oily, hot and spicy. Chunky foods like nuts and candy which can cause choking. P.S. Once you start solids, start feeding some amount of water also. It need not be more than 120-150 ml per day. Many babies suffer from constipation once they start solids. Having water will not only keep the baby hydrated, but also keep constipation at bay. When starting solid foods, give your baby one new food at a time — not mixtures (like cereal and fruit or meat dinners). Give the new food for 3 to 5 days before adding another new food. This way you can tell what foods your baby may be allergic to or can’t tolerate. Begin with small amounts of new solid foods — a teaspoon at first and slowly increase to a tablespoon. Begin with dry infant rice cereal first, mixed as directed, followed by vegetables, fruits, and then meats. Don’t use salt or sugar when making homemade infant foods. Canned foods may contain large amounts of salt and sugar and shouldn’t be used for baby food. Always wash and peel fruits and vegetables and remove seeds or pits. Take special care with fruits and vegetables that come into contact with the ground. They may contain botulism spores that cause food poisoning. Cow’s milk shouldn’t be added to the diet until your infant is age 1. Cow’s milk doesn’t provide the proper nutrients for your baby. The AAP (American Academy of Pediatrics) recommends not giving fruit juices to infants younger than age 6 months. Only pasteurized, 100% fruit juices (without added sugar) may be given to older infants and children, and should be limited to 4 ounces a day. Dilute the juice with water and offer it in a cup with a meal. Feed all food with a spoon. Your baby needs to learn to eat from a spoon. Don’t use an infant feeder. Only formula and water should go into the bottle. Avoid honey in any form for your child’s first year, as it can cause infant botulism. Don’t put your baby in bed with a bottle propped in his or her mouth. Propping a bottle has been linked to an increased risk of ear infections. Once your baby’s teeth are present, propping the bottle can also cause tooth decay. There is also a risk of choking. Help your baby to give up the bottle by his or her first birthday. Avoid the “clean plate syndrome.” Forcing your child to eat all the food on his or her plate even when he or she isn’t hungry isn’t a good habit. It teaches your child to eat just because the food is there, not because he or she is hungry. Expect a smaller and pickier appetite as the baby’s growth rate slows around age 1. Infants and young children shouldn’t eat hot dogs, nuts, seeds, round candies, popcorn, hard, raw fruits and vegetables, grapes, or peanut butter. These foods aren’t safe and may cause your child to choke. Many health care providers suggest these foods be saved until after your child is age 3 or 4. Always watch a young child while he or she is eating. Insist that the child sit down to eat or drink. Healthy infants usually require little or no extra water, except in very hot weather. When solid food is first fed to your baby, extra water is often needed. Don’t limit your baby’s food choices to the ones you like. Offering a wide variety of foods early will pave the way for good eating habits later. By 12 months, your child needs a variety of foods from the food groups. Learn more about Eating Well with various Food Guide. Establish a schedule of regular meals and snacks for your child. Breastfeed as long as you and your child want to continue. Continue to give your breastfed child a vitamin D supplement of 10 µg (400 IU). This provides a daily source of vitamin D.
If you are no longer breastfeeding, offer 500 milliliters (mL) of homogenized milk (3.25% M.F.) each day. Your child may like to drink a lot of milk. You should limit them to 750 mL each day to not affect their intake of other foods. Higher-fat, nutritious foods are an important source of energy for your child. Examples include breast milk, homogenized cow milk (3.25% M.F. ), cheese, avocado, nut butters, and some fish such as salmon or trout. Limit fruit juice and do not offer sweetened beverages. If your child seems thirsty, offer water. Eat together as a family as often as you can. Be a role model; try new and nutritious foods yourself. Always supervise your child when eating. Make sure your child is sitting upright and is not distracted. Do not let your child eat while walking or running, or while sitting in a moving vehicle. Introduce common food allergens one at a time. A food allergen can cause an allergic reaction in some children (like itchy skin, upset stomach or wheezing).Wait two days before introducing a new food. That way, if your baby develops a reaction, you’ll have a better idea of what food might have caused it. Do not offer solid foods that are hard, small and round, or smooth and sticky. These foods can cause choking. Do not offer herbal teas, sports drinks or other drinks with caffeine or artificial sweeteners. Cook all meat, eggs, poultry, and fish well. Do not use products with raw eggs to avoid salmonella poisoning. Do not offer unpasteurized juices, milk or milk products. To prevent infant botulism, do not offer honey to a baby younger than 12 months. For more information speak to your healthcare provider. You can also get practical infant feeding resources from your regional public health unit or community health center. By age two, your child should be eating three healthy meals a day, plus one or two snacks. He or she can eat the same food as the rest of the family. Do not fixate on amounts and do not make mealtimes a battle. Whenever possible, offer your child finger foods instead of soft ones that require a fork or spoon to eat. See the following sample menu ideas for a two-year-old. This menu is planned for a two-year-old child who weighs approximately 27 pounds (12.5 kg). As your kid starts growing, his/her dietary needs have to be taken care of. When a child turns three, it is time for parents to carefully look after the kid’s nutrition. This is because at this age, the kid gets into a lot of physical and mental activities. Most 3-year-old kids are sent to school. Beginning school means physical as well as mental exertion for the kids. Your kid learns a whole lot of new things at this age and therefore, it is extremely necessary that he/she gets proper nutrition. A 3-year-old child needs a balanced amount of vitamins, minerals, carbohydrates and fats. HOW TO MAKE YOUR TODDLER SMARTER? Giving your baby the right kind of nutrition can be a difficult task as toddlers tend to be fussy eaters. They are very rigid when it comes to food. But you have to get the nutritious things on their plates in the right way. Chalking out a diet plan for your 3-year-old kid seems like a right way to go about it. Here is a perfect diet plan for a 3-year-old kid. Take a look. You should start the day for your little one with a glass of milk. Along with the milk, give him/her two peeled almonds. Make sure you have soaked the almonds overnight. Breakfast is the most important meal of the day and so it has to be healthy and filling. A whole wheat tomato sandwich, buttered whole wheat toasts, or a salad wrap seems like a good option for breakfast. Brunch is the time between breakfast and lunch when your kid demands snacks. So, a bowl of mixed fruits or tomato soup would be ideal for your 3-year-old. A balanced lunch is very necessary for your kid. So, a small bowl of rice, 2roti/parathas, and half a bowl of dal and half a bowl of mixed vegetable vazzi are ideal for your kid’s lunch. For snacks, you can make him/her a nice chocolate milkshake which he/she is sure to love. Along with it, you can give him/her one or two cookies. Dinner should be light. A bowl of baked seasonal vegetables with 1parathas or small bowl of rice and half a bowl of dal and a small cup of curd should be enough for your little one.